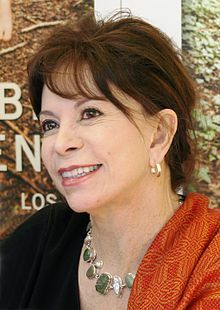 Isabel Allende (Spaingie: [isaˈβel aˈʝende] ( listen); born 2 August 1942) is a Chilean writer. Allende, whose wirks sometimes contain aspects o the "magic realist" tradeetion, is famous for novels such as The House of the Spirits (La casa de los espíritus, 1982) an City of the Beasts (La ciudad de las bestias, 2002), which hae been commercially successful. Allende haes been cried "the warld's maist widely read Spainyie-leid author". In 2004, Allende wis inductit intae the American Academy of Arts and Letters, an in 2010, she receivit Chile's Naitional Leeteratur Prize. Allende's novels are aften based upon her personal experience an pay homage tae the lives o weemen, while weavin thegither elements o meeth an realism. She haes lectured an toured mony American colleges tae teach leeteratur. Fluent in Inglis as a seicont leid, Allende wis grantit American ceetizenship in 2003, haein livit in Californie wi her American husband syne 1989. Hispanic Heritage Award in Literature (United States, 1996). ↑ Isabel Allende: "Big Think Interview with Isabel Allende" June 16, 2010"
↑ "American Academy of Arts and Letters - Current Members". Artsandletters.org. Retrieved 2012-12-21. ↑ "Isabel Allende gana el Premio Nacional de Literatura tras intenso lobby | Cultura". La Tercera. 1990-01-01. Retrieved 2012-12-21. ↑ "Hispanic Heritage Awards for Literature". Hispanic Heritage Foundation. Retrieved 11 January 2011. ↑ "Isabel Allende Wins the Hans Christian Andersen Literature Award". Hispanically Speaking News. June 28, 2011. Retrieved August 16, 2012. Bautista Gutierrez, Gloria and Norma Corrales-Martin. Pinceladas Literarias Hispanoamericanas. Hoboken, NJ: Wiley, 2004. Wikimedia Commons haes media relatit tae Isabel Allende.